it's time for "Soft Cozies"
I design and sew for them this season, every year. 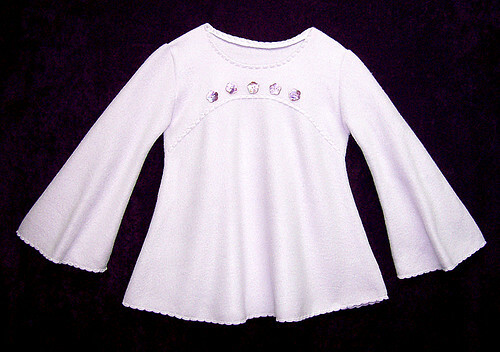 This Lilac fleece "swing" tunic features a curved bodice seam that is decoratively top-stitched and adorned with sweet flower shaped shell buttons. Starting with an Ottobre pattern, I liberally made design changes to suit the soft flowing look that I wanted this garment to have. What a neat shirt! I bet your niece will love it. What kind of fleece do you use? Hi Lisa....This particular fleece came from deep in my fabric-stash...so it is probably Malden Mills. However, I have had marvelous results with the "anti-pill" fleece from the chain stores in recent years..it lasts through an entire season of washing and keeps looking good. Good enough for 7 and 9 year-olds who are quite picky about how they look, LOL! Pam, darling shirt, I am sure Isabella will love it. Soft cozies. Could you ask for a better compliment? How sweet. Darling top, and the topstitching is the perfect touch. I think it's Soft Cozy time here, too! This is darling. I think I want one! That is absolutely adorable! Can you tell me which Ottobre pattern you used to start from? I've got to go dig through my magazines! That cosy top looks fab , your nieces will be kept warm and snuggly in their tops.